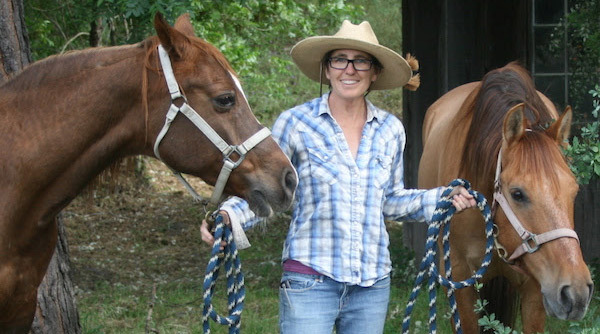 Celeste Carlisle with her horses, Tishka, left, and Sammy. Return to Freedom Wild Horse Conservation equine fertility specialist Celeste Carlisle has been appointed to a three-year term on the National Wild Horse and Burro Advisory Board. The nine-member board is tasked with providing advice to the Bureau of Land Management and US Forest Service on wild horse and burro policy and oversight. “I know a humane and elegant — albeit challenging! — management solution can be achieved for wild horses and burros, and I also know that it will require collaboration and ideas at a level we have not yet seen,” Carlisle said. Board members are appointed by the Secretaries of the Interior and Agriculture to represent various interests. Carlisle has been appointed to the seat representing wild horse and burro advocates. Other new appointees are Dr Tom Lenz (veterinary medicine) and Dr Barry Perryman (public interest). Carlisle earned a bachelor’s degree in biology with an emphasis in marine biology from UC Santa Cruz in 1994. In 2004, she completed a bachelor’s degree in animal science, with an equine option, at Oregon State University, where she was a National Science Foundation fellow. Her varied experience includes serving as director of horse programs at Midland School, a private, nonprofit, working-ranch boarding school in Los Olivos, California, as an environmental and science educator for the Oregon Division of State Lands, Oregon State Parks and the City of Santa Barbara. She has also worked with horses in a therapeutic riding program. Her volunteer work ranges from wildlife rehabilitation to serving as a certified Yolo County, Calif., disaster service worker for incidents involving animals. Carlisle has worked for Return to Freedom, a national nonprofit wild horse conservation organization, since 2005, serving first as equine and programs coordinator at RTF’s American Wild Horse Sanctuary in Lompoc, California, then as biologist and conservation science program coordinator as the sanctuary grew to provide care for wild horses and burros at five California locations. Carlisle manages RTF’s fertility control program, coordinating and sharing data with the Science and Conservation Center, which produces the PZP fertility control vaccine. At the time of its creation 19 years ago, RTF’s fertility control program was the fourth equine project of its kind in the world. It has achieved an efficacy rate of over 91%. Scheduled delivery of PZP allows many of the sanctuary’s 500 wild horses and 42 burros to remain in their family bands and has served as a model for humane minimally intrusive, management of wild horses and burros on the range. RTF works with other animal-welfare groups, conservation and science organizations and federal and state agencies, on collaborative projects related to fertility control. Since 2017, Carlisle has been part of RTF’s team in the drafting of a science-based proposal for population management offered by RTF and other organizations. The proposal provides an alternative to BLM’s push last year to euthanize tens of thousands of healthy wild horses and burros. As RTF’s conservation science coordinator, Carlisle played an instrumental role by modeling population growth, based on management scenarios, adding vital support for creating non-lethal alternatives. She also provides research and comments on behalf of RTF during public comment periods in BLM’s planning processes regarding wild horses and burros.